PRINT - CUT - SEW is faster, more accurate, and makes complicated designs possible. No measuring, no math, no weird expensive rulers, no templates, no paper to pick off. Sometimes we Print, Cut, and Sew. Sometimes we Print, Sew, and then Cut to avoid stretchy bias seams for Flying Geese and other triangles. Sometimes we only print one fabric to cut shapes from several more fabrics. Sometimes we combine hand and machine piecing in the same quilt, thanks to the lines! Love the lines. Quilt more! When you have lines on the fabric, the sewing methods are simpler. I am so confident that you will love it that you can start with a free shape collection with diamonds, triangles, and squares! 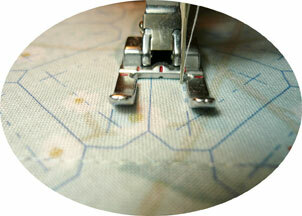 PRINT - CUT - SEW makes hand piecing faster, more accurate, and more portable than ever! No tracing, no templates, no special tools or markers. With no templates, hand piecing is more portable than ever. Print the shapes on the fabric and cut with a rotary cutter or scissors. 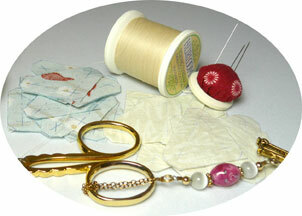 Sew with a running stitch along the line, or whip-stitch, if you prefer. Faster is not always our goal, but faster and BETTER--yes! That’s Inklingo. PRINT - CUT - SEW makes it faster and more accurate. You know from the beginning that you will be happy with the results. Perfect positioning with ultra-fine lines! There is even a free Appliqué Shape Collection, Circle of Hearts. It will make you a believer.